At Smart-TECNIC we pride ourselves on being able to carry out all aspects of servicing, repair and maintenance for smart cars. Here are some details and information on the services we carry out. Please see our Pricing page for information on costs. Smart-TECNIC can carry out re-gassing and repairs to air-conditioning systems on all makes of Smart car at competitive prices. Most problems are caused by the fracturing of one particular pipe where it fits into the air-con compressor. Please contact us for costs of this repair and costs of re-gassing etc. Smart-TECNIC carries the MB STAR diagnosis equipment which is a near-dealership level system. 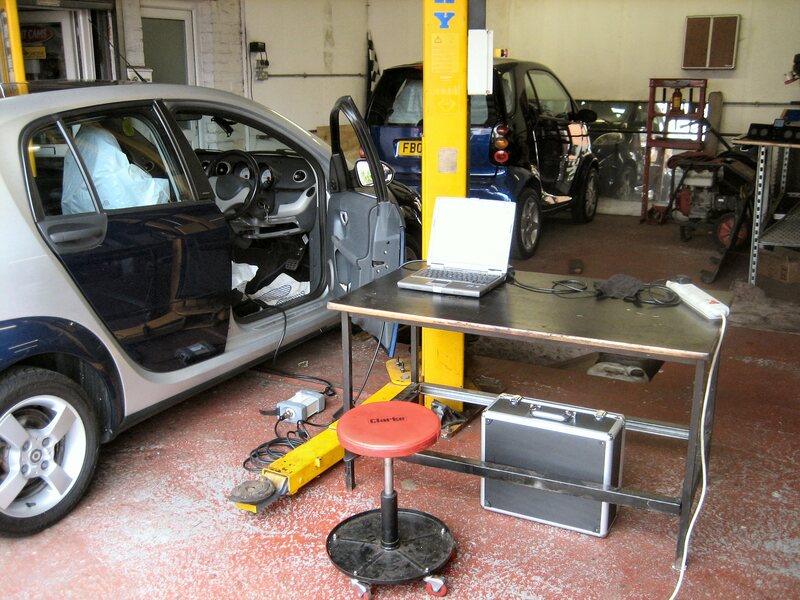 For just £60 we can carry out a scan of your car, print a report and clear existing fault codes from your ECU. 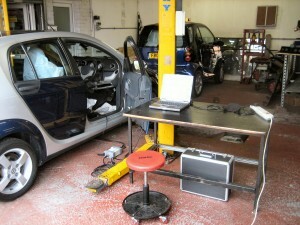 If your car has a mis-fire or you are worried about high oil consumption, we can also carry out a cylinder leakage test. The equipment we use for this pressurises each cylinder of your car’s engine, and determines whether the cylinder has compression, and if not it reveals why not. This test takes about an hour to complete and we charge £75 along with the diagnosis by MB Star. Smart-TECNIC can re-code keys as required, and can also supply new replacement keys, both of the single and three button type. We charge £60 for the coding of 1 – 3 keys. Please contact us for the cost of a new replacement key, and please note, we may be cheaper than eBay. The 450 City or Fortwo model should be serviced every 10,000miles or 12 months, whichever is sooner, following the cycle “A B A C”. We also recommend an intermediate oil and filter change which we do for just £40 while you wait (but must be pre-booked). The 451 Fortwo and 454 Forfour models have a simpler A or B servicing schedule, but we feel that the intermediate oil change is just as important. The sports car models have manufacturer intervals of 7,000 miles, but with an intermediate oil change we believe these can be extended to the same 10,000 miles as the City and Fortwo models. Despite information in the media that might suggest otherwise, timing chains (which are used on many engines instead of timing/cam belts) DO NOT LAST FOREVER. We STRONGLY RECOMMEND that on smart cars, particularly the 700cc models, the timing chain is replaced every 75,000. We are seeing engine failures on 700cc cars that would have been alleviated had this work been done. We offer a fixed price timing chain replacement service for £395 on City/Fortwo models, slightly more on the Sports cars. The timing chains rarely break, but the associated guide rails are known to fail especially on the 700cc engines. Replacement is recommended at 75,000 miles. This work includes a full Mercedes-Benz supplied timing kit which replaces the chain, all sprockets, all guides and a new hydraulic tensioner, new auxiliary belts and gaskets and seals throughout. We believe this service offers incredibly good value and represents a saving of up to a fifth of the cost of repairing the damage to an engine caused by a failed timing chain system. 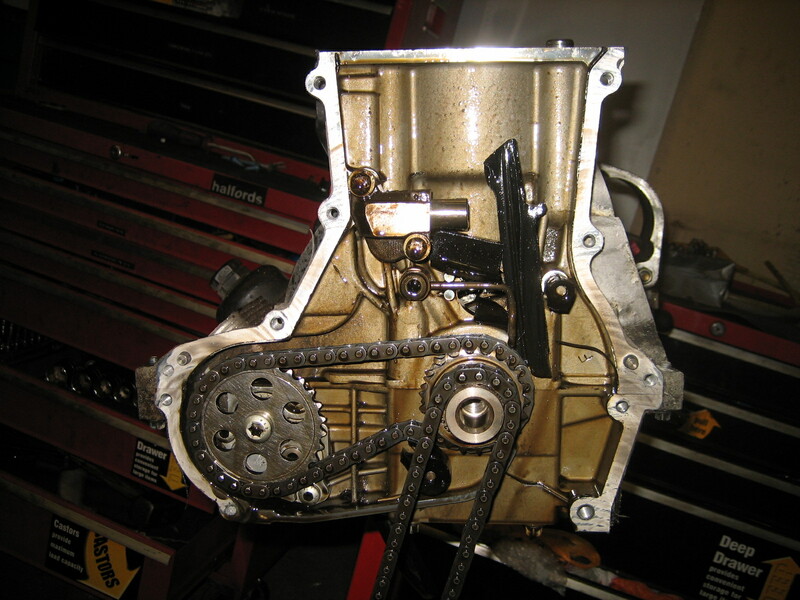 It is true that timing chains don’t snap like cam belts do, but timing chain systems do wear out and when in advanced stages of wear the fragments and particles of metal released into the engine oil by this wearing process can do an awful lot of damage. The smart owner can alleviate all of this by having the timing chain system replaced in good time. We can supply and fit brakes, tyres, exhausts and suspension. Just contact us for a quote, we know Smart cars and we believe we can do the best for the Smart owner. Please note that whilst much of our work is fixed price, our labour charge is currently £60 per hour including VAT, whereas the labour charge at main Smart/Mercedes dealers can be in the region of £140 per hour. For engine rebuilds or cars which are suffering major problems we can collect and deliver your car back to you nationwide at a very competitive price. Please call us and ask for a quote, you might be surprised at how inexpensive we can be. Please see our Pricing page for information on costs. If you can’t see the information you are looking for please don’t hesitate to call us on 0121 632 6070.